Tilapia (pronounced /təˌlɑpiə/) is the common name for nearly a hundred species of cichlid fishes from the tilapiine cichlid tribe. Tilapias inhabit a variety of fresh and, less commonly, brackish water habitats from shallow streams and ponds through to rivers, lakes, and estuaries. Most tilapias are omnivorous with a preference for soft aquatic vegetation and detritus. They have historically been of major importance in artisanal fishing in Africa and the Levant, and are of increasing importance in aquaculture around the world. Combining plant and fish culture in the same system results in a more natural, environmental friendly food production process than traditional agriculture or aquaculture. Instead of using synthetic fertilizers and the few inches of topsoil remaining on our land to grow agricultural crops, in aquaponics, the waste from the fish are used as fertilizer for the plants. The plants in turn purify the water for the fish, allowing valuable resources to be recycled and utilized more efficiently. There is no effluent discharge requiring costly filtration or wastewater treatment, and although it is an aquatic system, it only utilizes 3% to 5% of the water that traditional land based agriculture requires for irrigation. This means that you can operate an aquaponics system in resource limited regions, from dry infertile lands to urban settings, without the need for cultivable land or vast water resources. This also means that we do not have to rely so much on food coming from far places, but are now able to produce food locally. For people worried about the quality and the freshness of their food, aquaponics provides a means to assure a continuous supply of safe and nutritious food that can be grown right at home. Resources on Earth are being strained beyond sustainable limits. Aquaponics offers an economically viable, environmentally sustainable and socially responsible alternative to producing superior quality food locally and more in tune with nature. At Morning Star Fishermen we are learning and teaching others how to move from linear consumption or production processes, to cyclical ones, specifically designed and tuned for perpetuation of basic resources and life supporting systems. Tilapia are in many aquaponics sytems because they are hardy fish that like warm water, can thrive in fresh, brackish, or salt water, and have excellent tasting, firm, white meat. The fish also has a unique history and a surprisingly rare combination of qualities that are found in few other fish. This Tilapia is endemic to warm waters throughout the world. The aquaculture, or fish farming, of Tilapia is recorded in human history as far back as ancient Egypt. Tradition holds that the Tilapia was the fish that Jesus used to feed the five-thousand on the Sea of Galilee – thus one of its common names, “St. 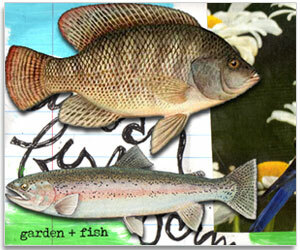 Peter’s Fish.” Tilapia is also referred to as “The Wonder Fish. A great service you are preforming for the people. With the shape ot this country is in, I’ve been thinking for doing the same thing for our community. The problem is I don’t know anything about aquaponics, but I understand that you have videos that shows the process. If possible I would like to obtain a set. If this is can been done please notify me by my email. Thanks and have a Blessed Day.